Peter O'Toole was an intense, blonde, soft-spoken actor who came to fame in David Lean's widescreen epic Lawrence of Arabia. His mother was Scottish, his father an Irish bookie, and as a youngster O'Toole often accompanied him to the racetrack. He was raised in Catholic schools, where he says nuns beat him as punishment for his left-handedness. He worked at the Yorkshire Evening News as a copy boy and later as a reporter, until he discovered the joy of performing on stage. After several amateur plays, he was admitted to the prestigious Royal Academy of Dramatic Arts, where his classmates included Alan Bates, Albert Finney, and Richard Harris. He joined the company at the Bristol Old Vic theater, making his first appearance in Major Barbara in 1956. He made his film debut far down the credits of Walt Disney's 1959 adaptation of Robert Louis Stevenson's Kidnapped, and after a few more films, he was still nearly unknown when he spent two years in the deserts of the Middle East filming Lawrence of Arabia. It is one of the rare classics of cinema that deserves every word of its gloried reputation. Lawrence of Arabia tells the true story of T. E. Lawrence, a British officer assigned to Cairo during World War I, who forged an alliance with Arab leaders, performed unlikely heroics, and eventually came to profoundly question his cause. Filmed in 70mm -- twice the size of ordinary movie film -- it should be seen on the largest screen possible. Unlike Titanic or Star Wars or other modern epics, it was made with virtually no "special effects" -- the enormous battles were filmed with a cast of thousands, not CGI'd on a Mac. O'Toole was nominated for the Oscar, but lost to Gregory Peck in To Kill A Mockingbird. Lawrence of Arabia, though, won seven Oscars, including Best Picture, and more than four decades later Premiere Magazine rated O'Toole's Lawrence as the best performance in the history of the movies. He was Oscar-nominated seven times, first for Lawrence of Arabia, then for his portrayal of King Henry II in two films, Becket with Richard Burton and John Gielgud and The Lion in Winter with Katharine Hepburn, for his singing schoolteacher in the musical Goodbye, Mr Chips with Petula Clark, his eccentric heir to the House of Lords in The Ruling Class with Alastair Sim, his sweetly sadistic moviemaker in The Stunt Man with Barbara Hershey, and his performance as the alcoholic star of swashbuckling movies in My Favorite Year with Jessica Harper -- a role that could have been inspired by O'Toole himself. He lost every time he was nominated, but was awarded an honorary Oscar in 2003. 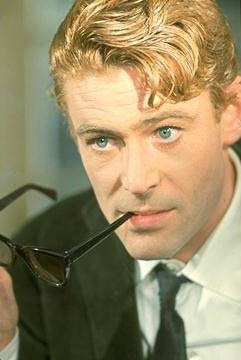 Among O'Toole's many other films, he played the tutor in Bernardo Bertolucci's The Last Emperor, the dashing cat burglar in How to Steal a Million with Audrey Hepburn, the eccentric military man who may be a murderer in The Night of the Generals with Omar Sharif, and the noble but misguided king in Troy with Brad Pitt. He gave perhaps his best unheralded performance as the U-boat captain driven to vengeance in Murphy's War. O'Toole's ex-wife, actress Si�n Phillips, co-starred in Murphy's War and had a long and successful career on stage and screen. She was perhaps best known as the deliciously evil mother on the PBS soap opera I, Claudius with Derek Jacobi or as the Reverend Mother in David Lynch's Dune with Kyle MacLachlan. She won the Tony playing Marlene Dietrich in Marlene on Broadway in 1999, and played Adrian on the TV series La Femme Nikita with Peta Wilson. Their daughter is award-winning stage actress Kate O'Toole, who works mostly in Europe. O'Toole's son from a later relationship is actor Lorcan O'Toole, best known for his role in Mrs. Palfrey at the Claremont with Joan Plowright. At what should have been the peak of his career in the 1970s, O'Toole was often oblivious due to what a gossip magazine called "heavy drinking, even by heavy drinking standards". He gave up the bottle in 1975, but had to undergo surgery the next year to have parts of his stomach and intestine removed, due to the effects of alcoholism. In 1977 he was hospitalized and came close to death from a blood disorder. Nicolas Roeg's The Man Who Fell to Earth was intended to star O'Toole, but when his health would not permit it the part was played by David Bowie. Dean Spanley (6-Sep-2008) · Fisk, Sr.